Phoenix, AZ -- I can feel the heat rising from the subcompact CUV segment. There’s so much friction in this category at the moment that all flammable materials should be kept at a safe distance. And now, the most incendiary member has arrived: the all-new 2016 Mazda CX-3. The 1st half of 2015 belongs to the small and subcompact CUV. In four months time, I’ll have driven the 2015 Jeep Renegade, 2016 Fiat 500X and 2016 Honda HR-V. Now, as the CX-3 hits the road, the segment comes into even sharper focus. Mazda knows the competition is fierce. It is with that thought in mind that they’ve pulled out all the stops and created a vehicle that is impossible to ignore. From a purely aesthetic point of view, the 2016 Mazda CX-3 knocks ‘em all dead. The drive is very good and could be summed up as follows: It drives like a Mazda. The packaging and pricing structures are simple and smart, and consumers will want one. A cross between the upcoming Mazda2, the current 3 and CX-5 (the one that launched Mazda's new brand journey), wedged somewhere in the middle, the 2016 CX-3 projects genuine attitude and a sense of confidence, as though it knew it was good. As the sixth KODO product, the evolution of the design language is clear and as sharp as ever. If you’re curious, the 2010 Shinari concept served as the original design theme. The cabin is set further back on the chassis, leaving room for the gorgeously long hood and the “A” pillars are closer to front passengers. The proportions are great, and overhangs are minimal. What’s more, the various surfaces are sculpted, playing with and manipulating light. A small CUV shouldn’t be characterized as beautiful, but the CX-3 certainly is. The CX-3’s cabin is deceptively unpretentious and sparse. Mazda managed to put forth what truly matters to occupants: comfort. At a quick glace, the HVAC controls seem to be the only ones on hand, but Mazda’s increasingly prevalent rotary wheel is located between the front seats and serves as the main artery for manipulating the onscreen menus. The simplicity of what lies before the occupants is striking, but many elements of the dashboard, door cards, and console are complex. If you look carefully, there are multiple levels of materials, pristine fit and finish, and plenty of room for four occupants and gear; it's quite the feat. Essentially, and right off the cuff, little 'ol Mazda is taking quality and design in this segment to another level. The SKYACTIV 2.0L 4-cylinder engine puts out 146 horsepower @ 6,000 rpm and equal torque @ 2,800 rpm. The standard SKYACTIV-drive automatic transmission is the same one found in other Mazda products, however, they've modified its size for it to fit it in the CX-3's tighter engine bay. For those wondering, a manual transmission will likely be optional in the future much like it was a late addition to the Mazda3 2.5L. The AWD system (lifted but modified for size from the CX-5) is available as an option on GX and GS trims, and standard on the GT. It features the same technology as the CX-5, which means it is active and involved with the drive unlike reactive systems. In other words, the delay in “activation” is nil so traction is instantaneous. Mazda expects to sell a 60/40 AWD/FWD mix. The rear suspension sounds like it's a step backwards as it uses a rear torsion beam compared to the CX-5’s multi-link setup, but it’s not. The simpler design is lighter and requires less room. This positively affects cargo space even with available AWD. Mazda’s dynamic tuning has eliminated any doubts about the twist-beam’s existence. 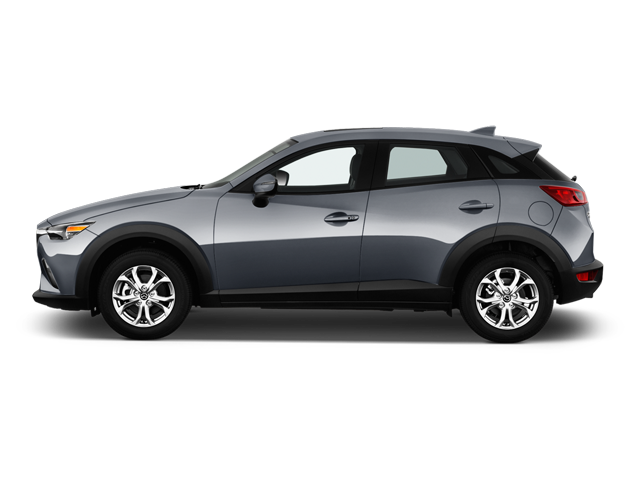 The 2016 Mazda CX-3 is exceptionally nimble and agile thanks to its lightweight and rigid SKYACTIV chassis. Its road manners are generally good and I say “generally” for one reason: The CX-3 is stiffly dampened and I fear that it may be a bit much for a number of our beat-up roads. Otherwise, handling is impressive, perhaps a touch above that of the 500X, and with more steering feel. Turn-in is sharp and steering effort is well judged. The CX-3 is borderline sporty, however, I was reeled back to reality when my right foot went down. Like many Mazda products, the CX-3’s power will never overwhelm the chassis or brakes. It’s a damned brilliant approach, and in truth the CX-3 needs no more power. The engine’s powerband suffers a mild lull around 4,500 rpm, but the transmission’s gearing is properly sorted to work with the available power. Mazda was a little late with the Mazda2 when the subcompact cars came into prominence. The early arrival of the CX-3 marks Mazda's intention on being at the forefront of this segment, and it will work. This is Mazda not messing about and intending on severely crashing the small CUV segment. At $20,695 (A/C and automatic transmission standard at this price), the base GX is packed with value. For $2,000 more, the GX AWD would be my personal pick, however, Mazda says the GS should be most popular trim. Mazda Canada plans on delivering 1,000 units a month for the remainder of the year, and I’m certain they will achieve that goal. The 2016 Mazda CX-3 arrives in showrooms by the end of May, early June. The Honda HR-V and Mazda CX-3, two of the most popular sub-compact SUVs on the market, take part in our latest comparison. Which one's the winner? Why the 2016 Mazda CX-3 before the Mazda2? Mazda Canada and USA made a quick and nearly spontaneous decision earlier this year, and I think it was the right one.